Edible seaweed comes in a variety of shapes, sizes and colors. Commonly used in various of Asian dishes, fresh and dried seaweed options provide essential nutrients such as fiber, protein, vitamins and minerals. Although most varieties of edible seaweed are deemed safe to consume during pregnancy, always check with your health care provider before altering your diet during pregnancy. All seaweed varieties contain minimal amounts of fat, however; several types have small amounts of omega-3 fatty acids, which is essential for your baby's brain and vision development. Seaweed provides a healthy and safe source of omega-3 fatty acids for pregnant women, who may not be able to tolerate or safely consume oily fish. Seaweed is an excellent source of vegetable protein and vitamin B-12, essential nutrients during pregnancy. Iodine levels in brown seaweeds help promote healthy thyroid activity, while iron is essential for hemoglobin production during pregnancy. 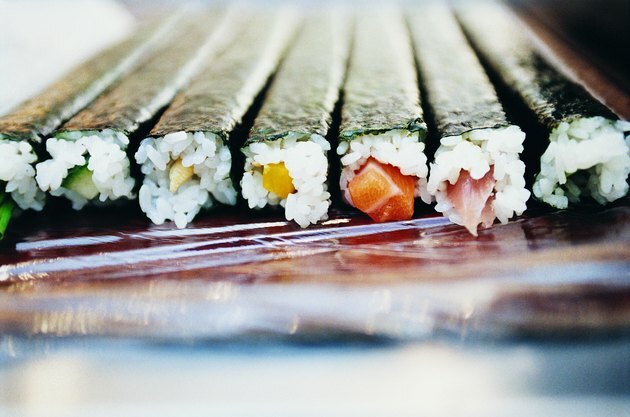 Nori, the most nutritious type of edible seaweed, is available in dried sheets and used to wrap sushi. The dried seaweed is 30 to 50 percent protein and high in vitamins A, C and B. Kombu, a variety of brown kelp, contains 10 percent protein and high amounts of iron. Brown seaweeds contain iodine, which is not present in red seaweeds, such as nori. Most seaweed varieties provide calcium, sodium, copper, potassium and zinc. Seaweeds also contain nonstarch polysaccharides, a gel-forming fiber that helps maintain healthy blood sugar levels and reduce triglycerides. Iodine is a necessary element that cannot be produced by the body. Most sources of iodine are found in concentrated amounts in edible sea life, including seaweed. The body needs iodine for healthy thyroid function. An iodine deficiency can pose serious complications such as infertility and thyroid cancer. Iodine deficiency during pregnancy can cause high blood pressure and possible birth defects, such as stunted physical growth. Seaweed consumption can help reduce the risk of iodine deficiency. Talk to your obstetrician or midwife if you suspect an iodine deficiency during pregnancy. While seaweed provides a variety of vitamins and minerals, it may also contain high amounts of sodium. Vegetarian sushi options are safe to eat during pregnancy provided they do not touch a surface that has been used to prepare raw fish. Pregnant women should avoid raw fish during pregnancy due to high mercury levels and the increased risk of bacterial infection. Although eating seaweed is considered safe during pregnancy, avoid supplements containing seaweed during pregnancy unless otherwise directed by your physician. Can Pregnant Women Have Vegetable Sushi?